NSA: Fallout From Snowden Leaks Isn't Over, But Info Is Getting Old : Parallels The National Security Agency's deputy director tells NPR he expects "other shoes to drop" from ex-contractor Edward Snowden's revelations. But "things have changed a lot" since the leaks, he says. 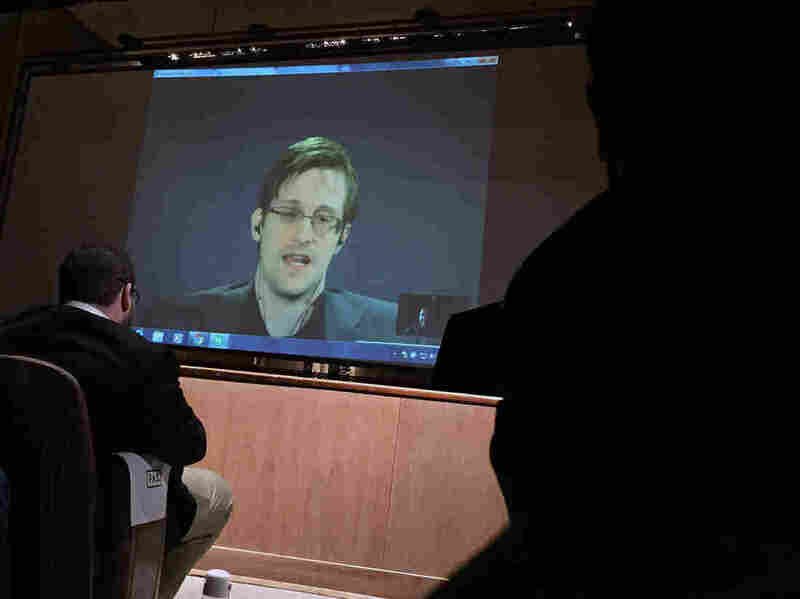 Former National Security Agency contractor Edward Snowden spoke via video conference at the Johns Hopkins University auditorium in Baltimore Feb. 17. The fallout from Edward Snowden's 2013 spying revelations is not over yet, according to Richard Ledgett, who ran the National Security Agency's investigation into Snowden's leaks. It's been nearly three years since Snowden, a former contractor for the NSA, told the world about the bulk collection of American phone records. But in an interview at NSA headquarters, Ledgett, the agency's deputy director, tells NPR that more classified documents about the internal workings of the government surveillance apparatus may yet come to light. "There are still some other shoes to drop, I think," says Ledgett. "There are things that'll probably be released that are designed to cause friction between the United States and other countries." 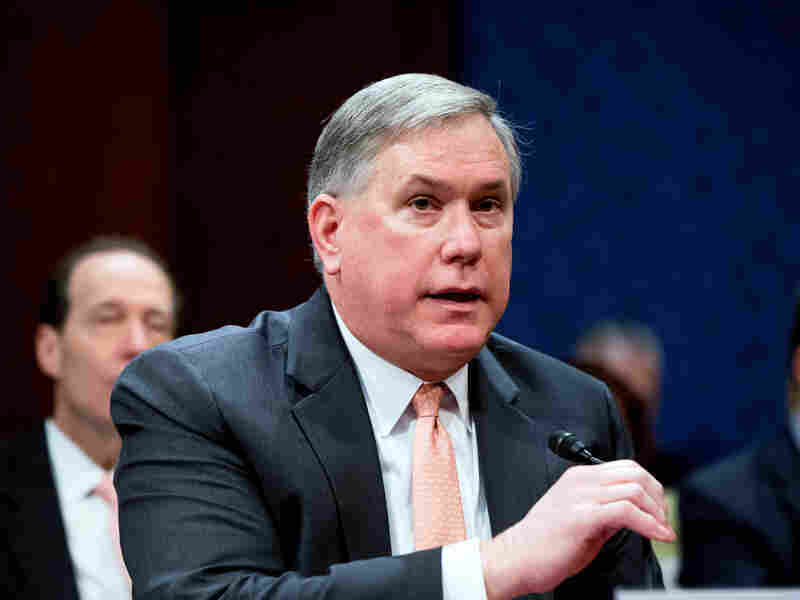 Richard Ledgett, the NSA's deputy director, shown here at a Feb. 25 House Intelligence Committee hearing, tells NPR that fallout continues from Edward Snowden's leaks. The good news — from the NSA's point of view — is these documents are getting old. Technology is changing fast, Ledgett says, and the NSA has adapted. "The date of Mr. Snowden's — the information cut-off date for when he stole that information and disclosed it — was June, or May of 2013," he says. "And so things have changed a lot between now and then. The amount that matters from a technical capabilities sense has decreased over that time." The less-good news is that since 2013, the NSA has watched as about 1,000 of its intelligence targets have "taken steps to remove themselves from our visibility," Ledgett says. Pressed for an example, Ledgett offers this: "There was a terrorist group that was actually engaged in operational planning directly against the United States and western Europe, that changed the way they communicated because of those disclosures. And they said they were going to do it, and they did it, and we lost track of them." Ledgett says this happened about 18 months ago. He declined to disclose which European country. The debate continues over whether Snowden is a traitor or a whistleblower hero. But there's no denying that he shifted the debate over what the U.S. government should be allowed to do in the name of protecting national security. The most significant signpost so far of that shift is the USA Freedom Act. Congress passed it last year to replace the post-Sept. 11 USA Patriot Act, and to curb sweeping surveillance authorities. It's been phased in gradually and only took full effect at the NSA on Feb. 29. "Personally, I like the new program," says Ledgett. Under the new law, it is phone companies — not the NSA — that store the bulk phone records of Americans. The agency must now get a court order to see them. Ledgett acknowledges the new system costs a little more, and takes a little longer. But kinks are being worked out, he says, and the NSA is still able to collect the intelligence it needs. The changes mandated under the Freedom Act come as the NSA embarks on its own internal changes. Last month, the agency embarked on a sweeping reorganization, dubbed "NSA 21." Ledgett says it will make the agency more nimble by merging cyber-offense and defense teams that used to be separate. "It's an agility thing, being more agile about how we prioritize, how we pivot from one topic to another," he says. "Because we need to be able to react to events, and ideally, from an intelligence point of view, to anticipate those events."